Alana Valentine’s Head Full of Love is a charming bit of storytelling – filled with humour and sensitivity as it tackles the serious issues of renal failure in indigenous Australians and mental problems in … well, all of us. 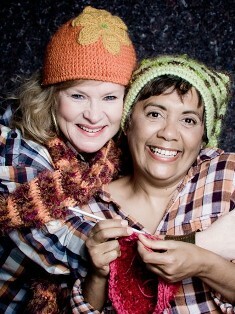 The play features two characters: one Aboriginal and one Caucasian. They are both older women and it’s delightful to read a play intended for mature actors. Nessa is an older white woman who is running away from something. She’s landed up in Alice Springs with almost no money and an invisible person sitting on her shoulder. Tilly is an Aboriginal woman from the Pitjantjatjara. She is busily crocheting beanies for the Alice Springs annual beanie festival and is finding it difficult to finish her entry for the competition because of her ongoing dialysis treatment. Renal failure is a real problem for Indigenous Australians – they are more than nine times more likely to be affected by End Stage Renal Disease than non-Indigenous Australians. For Tilly, it means that she has to spend four hours on dialysis three times a week. Nessa strikes up a conversation with Tilly when she asks Tilly to show her how to crochet. Soon Tilly has persuaded Nessa to give her a ride to the clinic for her dialysis and the two overcome their initial awkwardness with each other and gradually become friends. While Tilly’s dialogue comes across as very broken on the page, Valentine is explicit in her writer’s notes that this is because she is speaking in a second or third language and that her words should be performed with “variation, nuance and dynamism” – rather than stumbled through. Head Full of Love has plenty of pathos, but one scene I particularly enjoyed reading was the scene where Nessa describes getting lost in the bush. It’s a soliloquy delivered to the audience and is particularly effective. NESSA And if your skin is crawling because the poverty is so epidemic and the hardship is so obvious and there is so much filth and filth and dirt … then just accept it. Or get in your car and drive away not because you can’t handle it, no, just because, because you still have that choice.